WHAT IS THE NERVOUS SYSTEM AND HOW DOES IT MAKE US FEEL PAIN? First and foremost, living IN pain IS NOT NORMAL! Experiencing acute pain is a normal, human experience. Humans would not survive without our ability to experience pain. We need to know that putting our hand in fire or stepping on Legos can cause injury to our body. A deep, dull ache in your torso could mean something is very wrong in your organs, like a heart attack! These are all forms of acute pain, which signals an alarm in the brain to stop what we are doing. We know that we need pain in our lives to make sure we address issues with our body that aren’t good. Pain that lasts longer than a few weeks, especially longer than six months, is chronic pain, and that is something we can all live without. To start, lets get a better understanding of our nervous system. 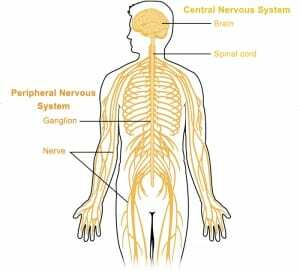 Our nervous system is comprised of 45 miles of nerves and more than 400 individual nerves, which are all connected like a network of roads and highways. The nerves connect all body parts to your spinal cord so that messages can be sent from tissues to the brain in order to analyze what’s going on. Think of your brain like a major city. When you are in a town a few hours away from the big city, there are a lot of single lane highways; but the closer you get to the city, the wider the highways get and the more cars that are on them. Your body is very similar. In your arms and legs you have small nerves that get bigger and bigger the closer to your spinal cord they get. The spinal cord is very small at the lowest point, around the small of your back, and gets bigger and bigger the closer it gets to your head till it all meets at the big city, which is your brain. The way we experience pain is through these nerves. Nerves pass information, like pain, to the spinal cord, which then passes that same information to the brain. 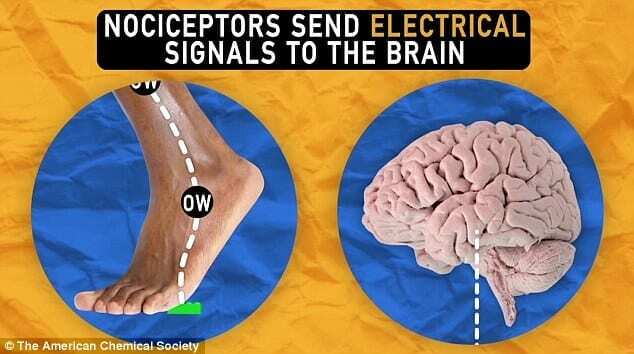 You see, when you step on that Lego, it stimulates a nerve on the bottom of the foot, called a nociceptor, that sends a signal along a nerve, to your spinal cord, then possibly to your brain. Some pain causes an immediate reflex at the spinal cord then the brain then processes that signal as pain; whereas other times, we process the information in our brain then our brain sends a signal back to the body to help stop the pain. We see this all the time in our daily lives…like when you touch a hot plate and you drop it first then a split second later feel the burning in your hand. HOW DOES THAT RELATE TO PAIN? We know that pain and temperature run along a very specific nerve tract, called the spinothalamic tract. This tract can be broken into two very specific divisions, the neospinothalamic tract and the paleospinothalamic tract. The neospinothalamic tract is responsible for the sharp/stabbing pain and basically runs directly to the part of the brain (postcentral gyrus) responsible for feeling that very specific part of the body. This is how we feel acute pain like the sharp, stabbing pain we feel when we step on a Lego in the middle of the night. The paleospinothalamic tract is a little different. The pathway is a little slower and is felt more like a deep ache or dull burning. These nerve fibers tend to be more align with what we understand of chronic pain and inflammation. While the neospinothalamic tract goes to one specific part of the brain, the paleospinothalamic tract goes to multiple different areas of the brain. Activation of this pathway can effect your mood, heart rate, blood pressure, and the pain you feel isn’t very specific. 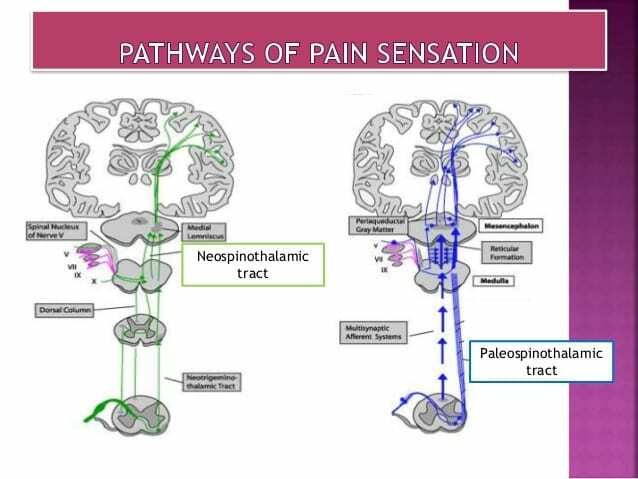 So that is the anatomy behind acute and chronic pain, next week we will discuss how these pathways are activated.